﻿ How to use 4Card Recovery to recover data off all kinds of memory card usb etc. 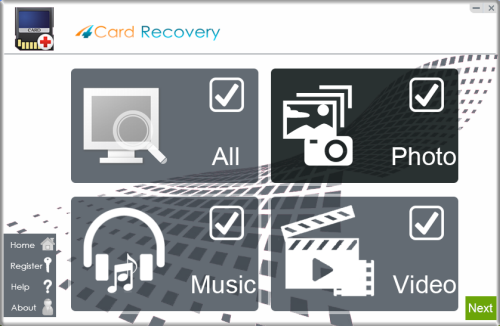 Free download this card recovery program to get photos video files from memory card including sd, sdhc, tf, cf, mmc, microsd etc. Never use your memory card once you found you have lost important data or your memory card are not accessible to you. Why? Inside photos being overwritten could technicially delete your data forever. So do not use your card again before using 4Card Recovery to get data restored. 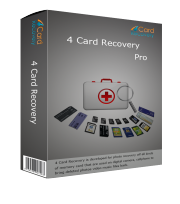 Before recovery, you need to download free 4Card recovery software and install it on your PC. The card restore utility is 100% free from virus or any other protetial threats. After the setting up process, you may launch the program to see its main screen and starts the recovery now. Select recovery types of your lost files. You may select "All" or just "Photo", "Music", "Video". 4Card Recovery will let's you select your card that shows on the detected drive. Select the drive that is your card and then click "Next"
Wait while the program scans your lost data. Wait while scanning lost photos, sometimes it takes about 20 minutes to scan a 32G card. what's already found. Since the card may contains bad blocks that takes longer time than usual. Preview your lost photos. When 4Card Recovery finishes scanning, it would take a few minutes to show your lost files. Paitience is still appriciated. And then you may preview your lost photos. In the recovery process, patience is appriciated since it takes time to scan lost files. Tips: Please do not save lost data to the drive you lost them to keep them from overwritten. 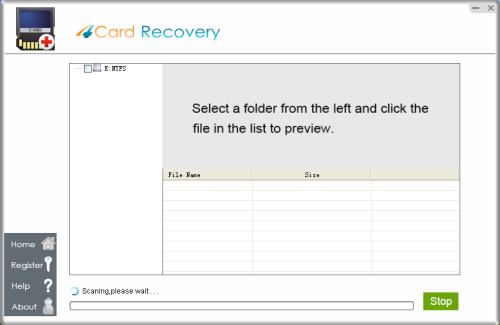 Download 4Card Recovery Free to start memory card photo recovery now!